Just as some applications let you place furniture in your living room, you can very easily build an application with SpatialStories in which you will instantiate your desired furniture and decoration to test it at home. 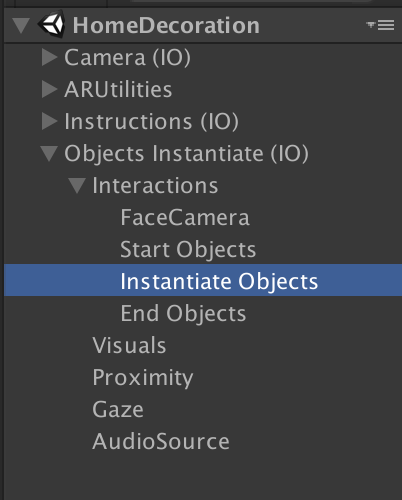 In the following example, we are using the Object Instantiator Behaviour, as our assets are not interactable. This is the hierarchy of the project. Once converting the camera into an Interactive Camera we have the ARUtilities added to the scene. 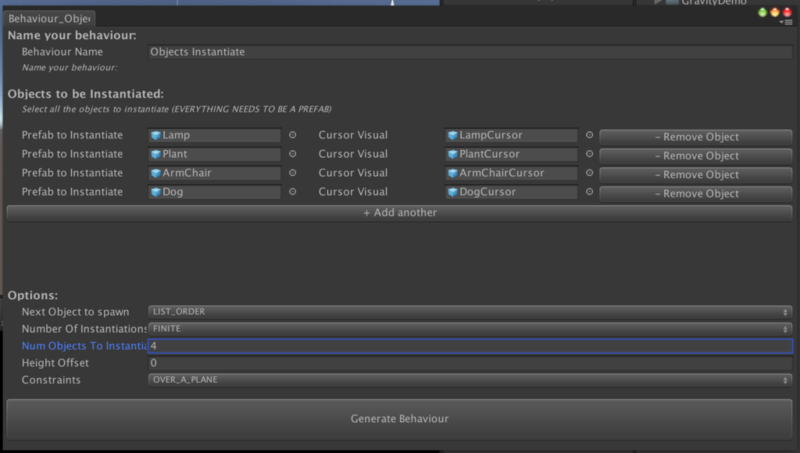 Then we add the Instructions prefab and create a behaviour we name Instantiate Objects. Get your assets ready: for this demo we created some assets with Google Blocks in VR. We downloaded the FBX files and added them to the project. You can import any model you want. Create the prefabs for your behaviour: drag the assets you imported into the scene. Place them properly inside an object with the pivot at the bottom if it’s not already the case. For each asset create a corresponding cursor. In our case we just have the same model with the circle Cursor below (this Cursor is available inside the Prefabs). 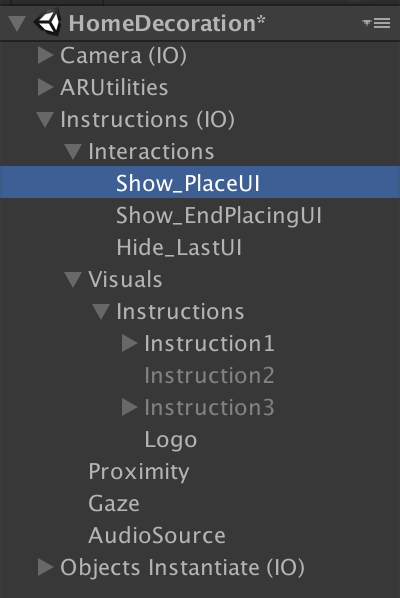 Now all your assets and cursors have to be dragged in your project inside a folder so they will become Prefabs. You can then delete them from your scene. Set your behaviour: choose whether you want the objects to be placed in the order you defined or in a random mode*. Then specify if you are instantiating only a given number or if you will be instantiating endlessly. In our case we want our objects to be placed in order, and only be placed once so we choose LIST_ORDER, FINITE and put 4 as the number of objects to instantiate. Warning: choosing random causes some Prefabs not to be placed as the system only instantiates the Number you specify and he can choose twice or more times the same Prefab. Set how objects will be placed: Here our objects should go either on the floor or on a desk so we choose OVER_A_PLANE to make sure they will be placed over flat surfaces. Guide your user: link the Instructions to the generated interactions. – A last interaction hides the text when the user taps on the screen (using Touch anywhere condition).